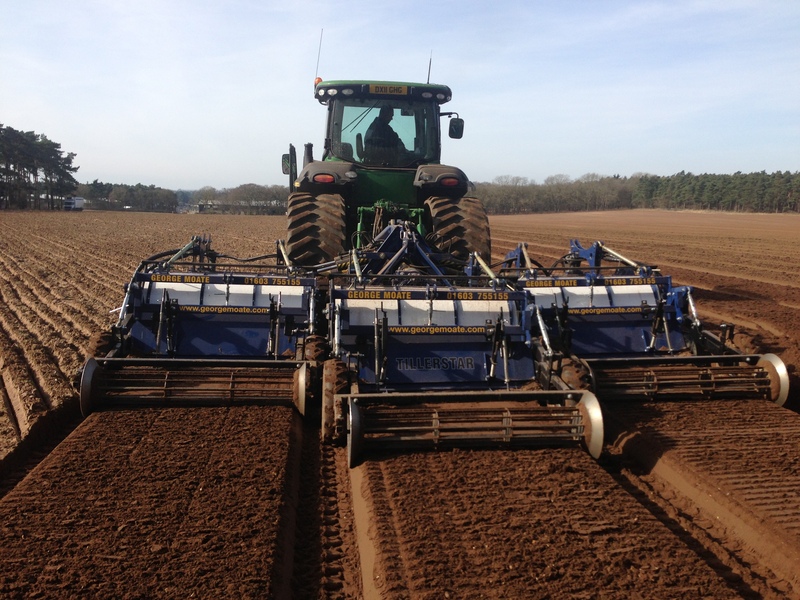 #NFDF2014 blog: Can @GeorgeMoateLtd’s Norfolk engineered #Tillerstar help deliver #Sustainable farming? Don’t let anyone tell you that engineering in this country is finished. Even here in Norfolk, which many people wrongly think of as a sleepy backwater where everyone is a farmer or retired, we have a thriving engineering and manufacturing sector. As World Class Norfolk reports, there are some 1,000 engineering firms in the county, employing around 10,000 highly skilled people (around 5% of the workforce) and supplying global companies such as Boeing, Airbus, NASA, Toyota and Lockheed. One of these successful companies is George Moate Limited, run by Lesley Pratt and her husband Richard. It makes the award winning Tillerstar, which is helping to revolutionise the planting of vegetables and root crops. And when I say ‘make’, I don’t mean ‘assemble using imported components’: I mean it manufactures virtually every single part in its factory on the edge of North Walsham – so is an ideal subject for an #NFDF2014 blog. 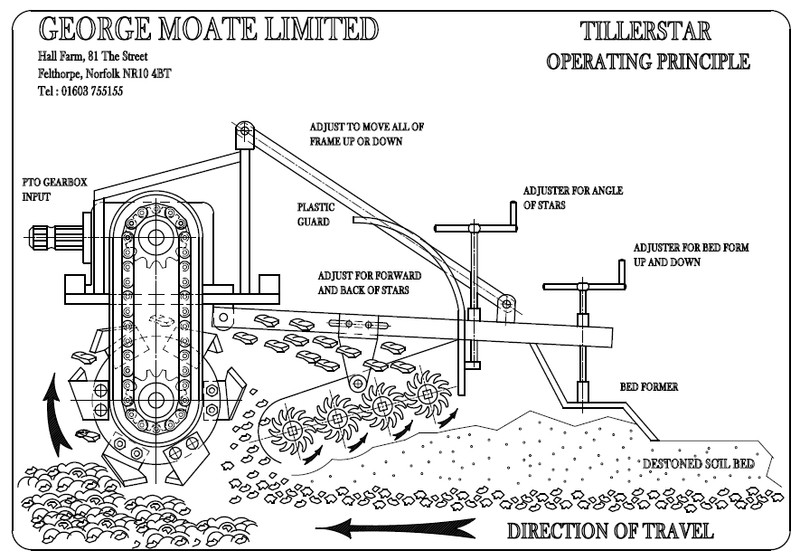 George Moate, a Yorkshire farmer and inventor, was the firm’s founder. Over the years he’d developed various bits of agricultural machinery, including bringing the first hydraulic folding tilling machine to market. Then, in 2011, he exhibited a prototype Tillerstar at the Harrogate Show and suddenly the enquiries started pouring in – leaving George with a hard choice: stick to farming (which he loved) or run a full-scale engineering business; he chose farming. Lesley, an experienced business woman who’d been looking for a new venture after taking time out to raise a family, bought the patents and set about developing the business. This included making 23 major engineering changes to George’s original designs. She also bought back eight prototype machines and had them upgraded to match the new specifications: “We didn’t want any machines out there with the George Moate brand that didn’t meet our standards,” she explains. Lesley’s partner (in life and business), Richard, already owned a successful engineering company called PSS Steering & Hydraulics, also based in North Walsham. PSS specialises in manufacturing, designing and re-manufacturing parts for heavy duty vehicles and machines made by the likes of Land Rover, John Deere, and JCB. With a 70 strong team of designers, engineers and machinists, it is ideally equipped to make most of the components for the Tillerstar. What makes the Tillerstar different? As Lesley explained to me, there has been a quiet revolution in potato farming over the last 30 years or so. When I helped with potato harvesting, during my summer holidays in the early 80s, we had to pick out the stones and clods as the potatoes were carried up the conveyor belt to the trailer. Then farmers introduced new machinery to de-stone fields before planting, by sifting the stones and dumping them in deep-ploughed trenches running alongside the planting ridges. While this means harvesters now lift far fewer stones with the potatoes, it creates two major problems for potato farmers and agriculture in general. The first is that the stones have to be ploughed up at the end of each season and re-scattered, before other crops can grow successfully. The second is that, over time, all this deep ploughing degrades the soil structure and reduces fertility, which means farmers then have to use more expensive fertilisers to maintain yields. Deep ploughing, trench digging, and re-scattering is also labour and machine intensive, costing a lot in terms of time and fuel. The beauty of the Tillerstar’s innovative design is it lifts and sieves the soil, and forms the planting bed all in one go, without needing a separate trench for the stones. By reducing the number of ‘passes’ the tractors make, it saves money (one farmer in Ireland estimates he is saving £50 a hectare in fuel alone) and reduces soil compaction. The Tillerstar gets its name from the four horizontal, rotating star rollers fitted behind the cultivator (see illustration above). The cultivator lifts the soil and throws it back onto the rotating stars. These then throw the heavy stones and clods forward into the bottom of the newly dug bed before letting the finer soil fall through behind to cover them. The integral bed former, which the operator can change to suit soil conditions and produce the desired finish, then mounds up the earth ready for planting. As such, the Tillerstar only has to turn 6-7 inches of soil to create a bed that’s 12-14 inches deep – which further helps save fuel and reduce soil degradation. While scattering the heavy material in an even layer across the bottom of the bed not only improves drainage but also removes the need for re-scattering at the end of the season. Despite only being launched three years ago, the Tillerstar has already won a string of awards. These include: The Innovation Award from the British Carrot Growers’ Association in 2012; a Gold Medal at the Royal Norfolk Show in 2013 for Best Commercial New Machine; an Award of Merit in the Best New Product or Innovation (Mechanical) category at LAMMA 2014. The machine is now being used successfully across virtually every main soil type in the UK and has satisfied customers in Ireland, Norway, Poland, Russia, and New Zealand (with new enquiries coming from Africa, the Middle East and America). If you have any questions, comments or suggestions, please post them under this blog or tweet them to me. I will do my best to reply. Look out for my other blogs about the Norfolk Food and Drink Festival 2014 (see my earlier post about being an #NFDF2014 Champion) – and stories from around the county – I hope you enjoy them. This entry was posted in #NFDF2014, Business, Local Food, Nature, Norfolk and Norwich and tagged #agrichatuk, #STEM, Agriculture, Energy Efficiency, Engineering, Farming, Food, Innovation, Potatoes, Soil, Sustainability by Huw Sayer - Business Writer. Bookmark the permalink. That’s a nice piece. I would love to see a whole article on the ‘Agri Manufacturing Hub’ that is Norfolk. George Moate is one of many great businesses operating in this sector. Thank you Paul – really appreciate you taking the time to comment. It’s certainly a fascinating sector – and I’d love to write a whole article on it, if someone was prepared to commission it (Tekpro and Sands are just two of the other local companies I’d want to cover). If you would like to discuss this further, please let me know. Meanwhile, look out for this evening’s blog about one of Norfolk’s vineyards.